The Remote Control (RC) is a module, part of the blessTags application, which can send different commands from a SensorTag device (CC2650STK, Thunderboard React, Thunderboard Sense and CC2541DK) to: (a) an application running on Windows or (b) even to the operating system. The main idea of this module is to insert different keyboard shortcuts into the keyboard input stream when a button from the SensorTag was pressed. In this mode blessTags application allows you to transmit standard remote-control signals to PC. This allows you to control your computer using one of the following SensorTags: CC2650STK, Thunderboard React, Thunderboard Sense and CC2541DK. There are two different lists of remote commands: (a) a predefined one and (b) a custom list by the user. 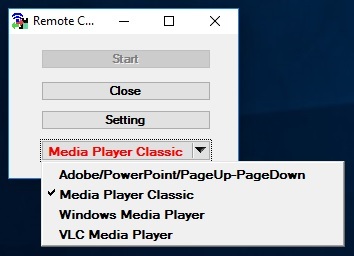 After the RC application has been started, these predefined commands can be selected from the list located at the bottom of the application window - see the figure below. Page Up – Perform the previous animation or advance to the next slide. All of these shortcuts are working only in the case they are the predefined one. This happened because in the MPC the shortcuts can be redefined in View \Options\Player\Keys option. Even if the list of the predefined applications is not very extensive (only 4 application), this should not be a problem because the user has the possibility to define their own commands. 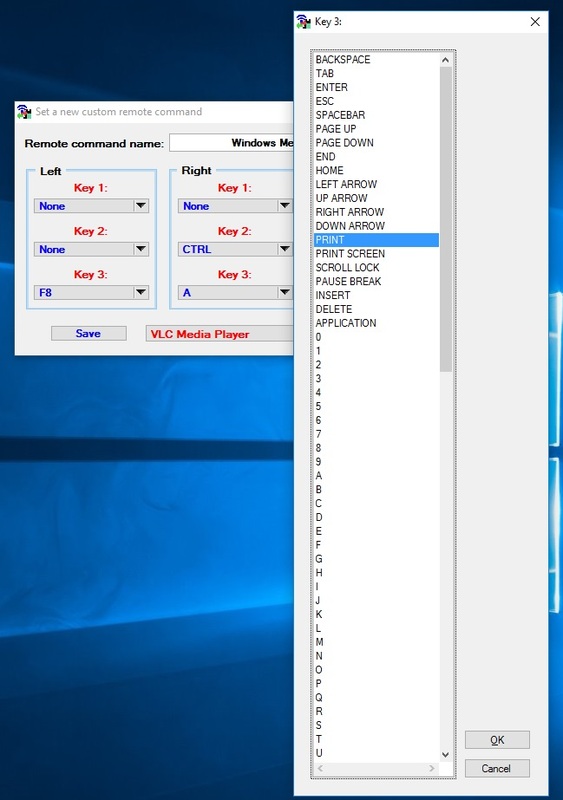 Any blessTags application user can define up to 20 different lists of remote commands. Each remote command, associated with a SensorTag button, can generate any shortcut requiring the pressing of a combination of no more than three keys. Normally, in the specification of different applications, the requirement of pressing of two or more keys at the same time is indicated specifying the keys with a plus sign between them. Each list of shortcuts must have a name. The name must be introduced in the box placed on the upper part of the window (see above figure) and must have no more than 50 characters. This name will identify the relation existing between the SensorTag buttons and the shortcuts. Using the buttons "Save" and "Delete" the list of users defined remote commands can be modified accordingly with the wishes of the blessTags application users. 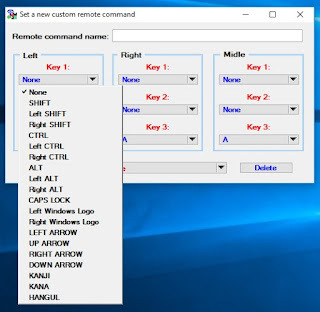 After the new commands are defined, the window bust be closed with the "Close" button ("X") and the list of commands in the main Remote Command module window will be updated accordingly. 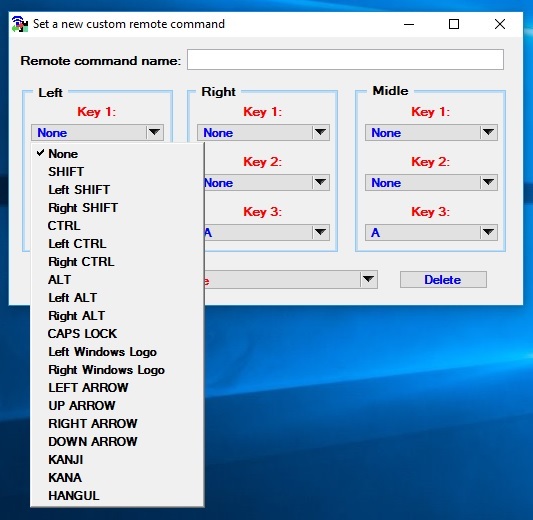 In the following video, I will do a short demonstration of how to manage and operate the user define list of remote commands. The blessTags application can be downloaded from the Windows Store Apps: https://www.microsoft.com/store/apps/9p054xsjjr1n.